Arthur Herman’s book, The Cave and the Light, is an ambitious book of philosophy, history, sociology, rhetoric, and politics. The general idea behind this Pulitzer Prize Finalist book is that all of Western Civilization’s philosophy (and by extension, society and politics) comes back to the ideas put forth by Aristotle and Plato. And at the same time, that there is still much to be learned from these early philosophers. Herman hits the significant periods of Western thought, including the rise of Christianity, Machiavelli, the Renaissance, the Reformation, Darwin, and through the World Wars, and he examines the prevalent thought at the time and how it follows either one (or both) of the classic philosophers. The journey here that Herman takes us through is extraordinary. Each period is examined very thoroughly and the ‘modern’ (to the period) or working thought of the time is dissected and compared to the ancient Greek thought. This is no easy feat, of course, but Herman weaves the narrative convincingly … on the surface. But on deeper inspection we have to wonder at some of the connections that Herman has made. It would seem that in every significant age, the leading thinkers of the time – whether philosophers or political leaders – spent a fair amount of time thinking about how Aristotle or Plato influenced them. And while I would agree that the teachings of Aristotle and Plato still have a connection to modern man, I’m not convinced that it’s as intricate as Herman connects it. I enjoyed the early chapters, particularly those that focused on the master and his pupil and their disagreements and their core common beliefs. But oddly enough, with each generation, I enjoyed it less and less, so the closer it got to times that were familiar to me, the less I bought in to the premise. It seems to be a fairly common practice to write non-fiction, history books with strong fiction attributes. We put words into people’s’ mouths that we have no idea of they were ever really spoken, but base it on ‘likely conversations’ and that’s just as much the case here. It can be effective, and it was early on, but the more real the history became, the less real Herman’s take became for me. I’d recommend this book up through the age of the Romantics, perhaps through the Victorian era, but not much beyond that. Looking for a good book? 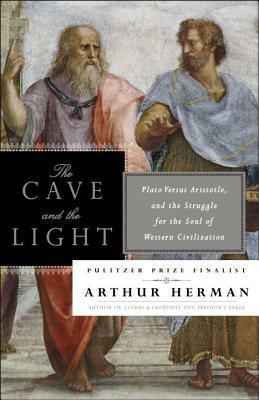 The Cave and the Light by Arthur Herman is a history of philosophy, specifically the Aristotle and Plato philosophies and how they might have continued to influence modern through the ages, into today. It’s a lot of speculation, interestingly told.